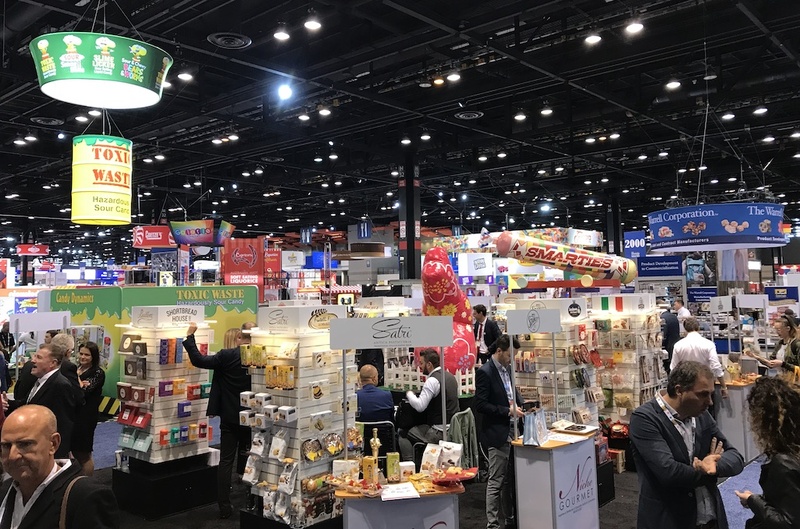 Every year we are anxious to attend the annual Sweets and Snacks Expo in Chicago. 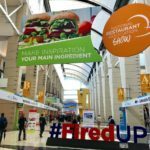 Right on the heels of the National Restaurant Association Show, it’s a busy and exciting week for us food lovers. 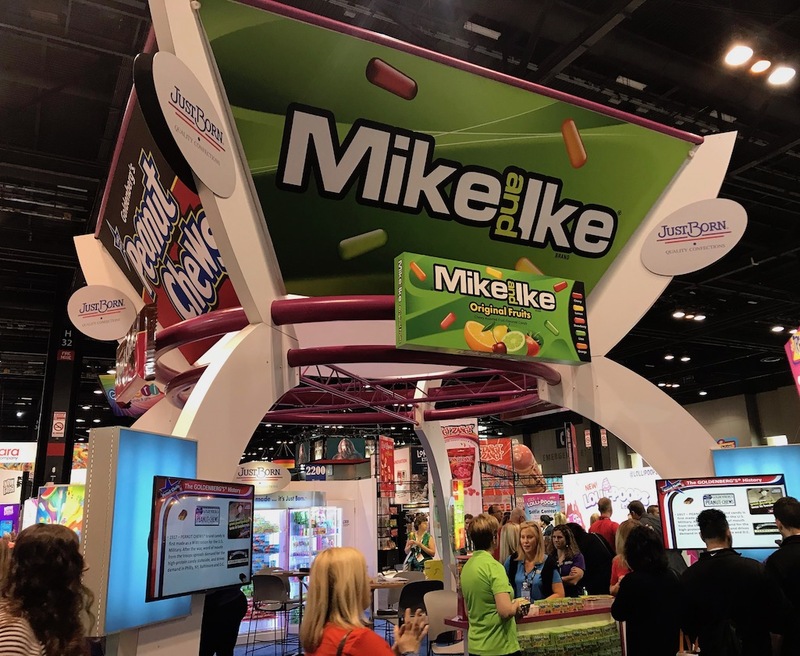 We especially enjoy the Sweets and Snacks Expo because we’re always looking for the latest snacks that are tasty, good for us and portable for travel. This year’s expo featured more than 850 exhibitors including 150 first-time vendors. Clearly, this is a category that is growing more and more each year. It’s not surprising that the confectionary industry handles over $35 billion dollars in retail sales every year. 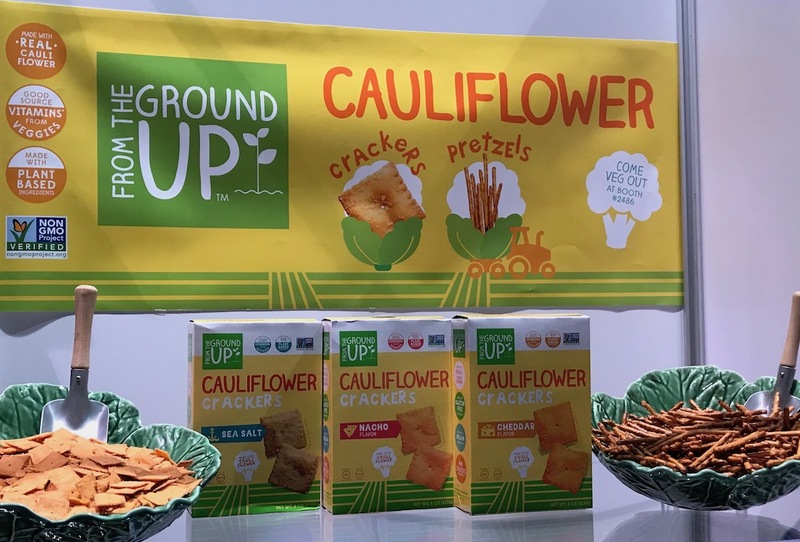 This year’s theme for the show was “Always A Treat.” Many snack makers are taking advantage of the emotional connection some of us have with food and highlighting that their products are an indulgence to be enjoyed in special moments. 92% of Americans say that candy is always a treat. 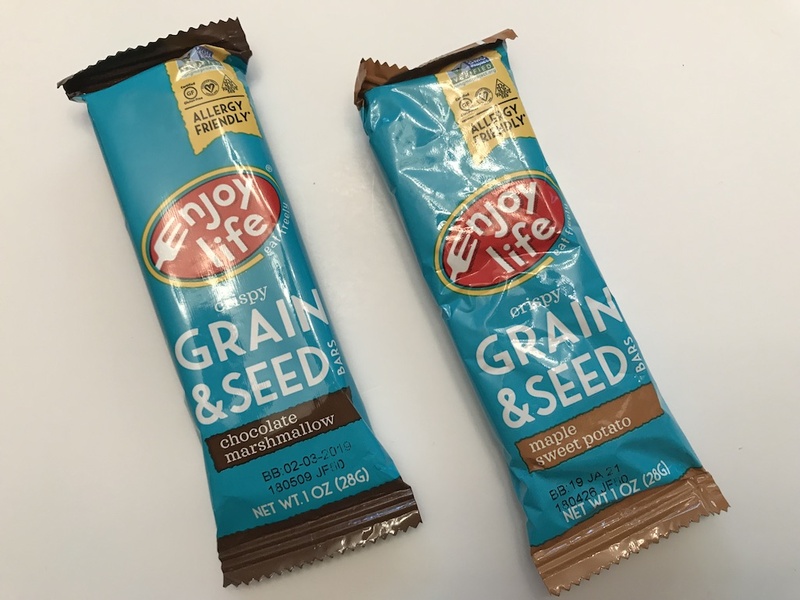 This idea was made even more apparent this year with the continuation of smaller grab-and-go packaging clearly labeled with nutritional information. More and more people are reading labels. Not only counting calories but checking sugar, salt, and artificial additives. Millennials may be known for it, but many others are also looking for more natural products with fewer and natural ingredients. We also saw more plant-based protein products. Salty snacks made from chickpeas, cauliflower, beets and more. As well as many using different proteins like fava beans, quinoa, peas, mushrooms and even crickets. Many of these are not new but this year more of the products actually taste good! Whether you’re looking for salty or sweet, unique flavors and combinations were the order of the day. Here are some of our favorites from this year’s show. If you’re like us getting to the airport, no matter what hour, is a chore and you rarely have time for a proper meal before you leave. Having the right snacks in your bag can help get your trip off to a good start. A new brand for us this year is Made Good. 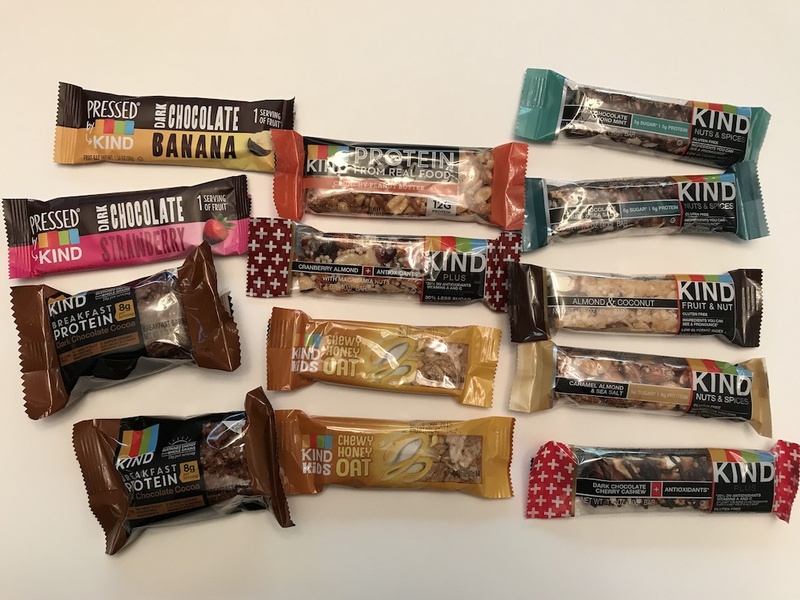 We sampled the granola bars, granola minis and crispy squares. We loved that the granola bars are made free of peanuts, tree nuts, soy, dairy, egg, fish, shellfish, gluten and sesame. 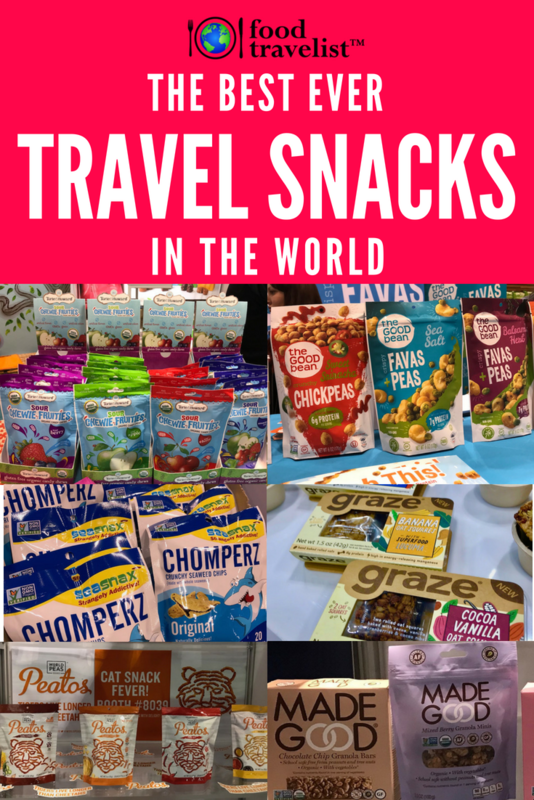 They not only taste good and make a good travel snack but they are also allergy friendly and in this day and age a school-safe snack. I’ve long been a fan of the Graze brand. Their dark chocolate cherry tart snack is one of my original go-to travel snacks. It’s savory, sweet and chocolatey. Perfect. 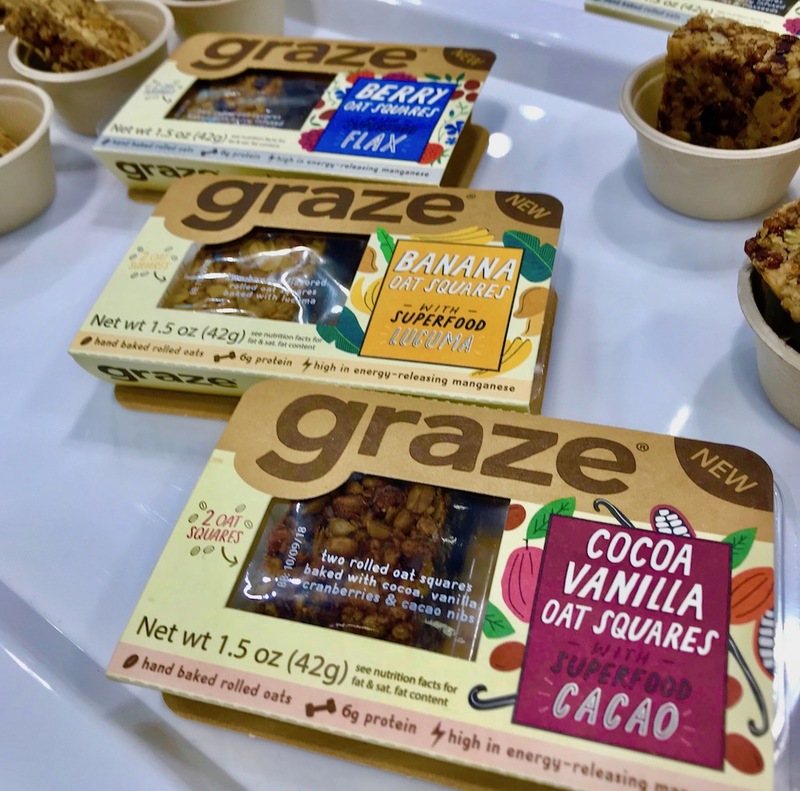 We had a chance to sample their new oat squares and they are a winner. Each features a superfood like chia, cacao, flax or maca. As always, they are in a convenient purse or briefcase size package making it a perfect travel companion. I’m pretty sure that just about every traveler has picked up a KIND® bar in an airport or convenience store. They are everywhere. I have to say that I’ve not been a fan because I don’t really like many nuts. 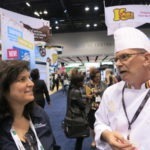 I was thrilled to learn about their Pressed by KIND® bars that contain just fruit and chocolate. They are really good and the new dark chocolate cacao Breakfast bar (which has 8 grams of protein) also has no nuts. They have so many bars and bites to choose from now that there’s something for everyone. Plus we love their mission to spread kindness. Who can’t use a little more of that in their lives? Salty savory snacks are what I crave a little bit later in the day or during my mid-afternoon slump time. I love something crunchy and chewy to get me going. I’ve been watching my salt intake so the first thing I did when I arrived at a booth at the Sweets and Snacks Expo was examine the labels. You might be surprised by how much salt and sugar are in many snacks. This brand A Truly Good trEAT4U has either very low sodium or no sodium and a nice blend of nuts, seeds, fruit and even chocolate. Each 1 oz. serving has less than 100 calories, less than 20g of sugar and less than 200mg of sodium. 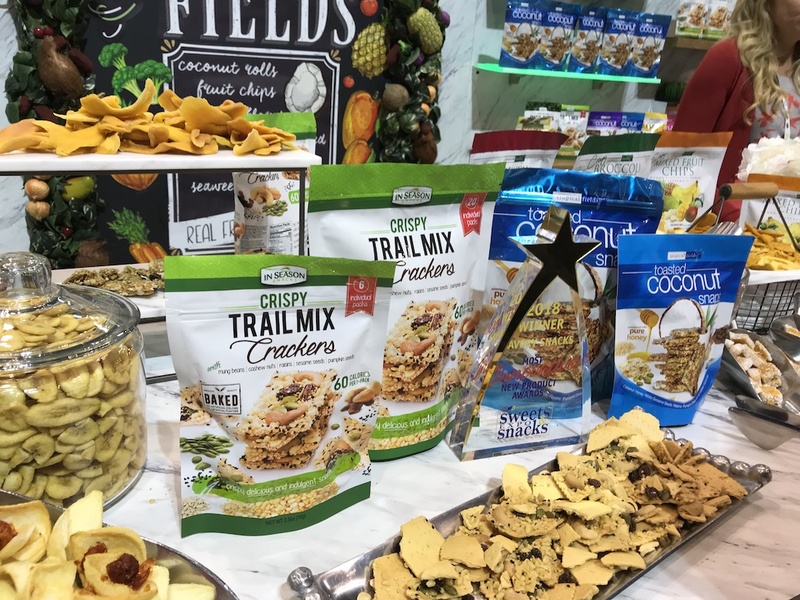 We fell in love with the In Season brand last year when we tasted their dried fruit and dried veggie selections. This year they had a winner with the Crispy Trail Mix Crackers. These crunchy crackers are high in protein and fiber because they’re made with mung beans, cashew nuts, raisins, sesame and pumpkin seeds. Only 60 calories in the individual packets make this another great travel companion. 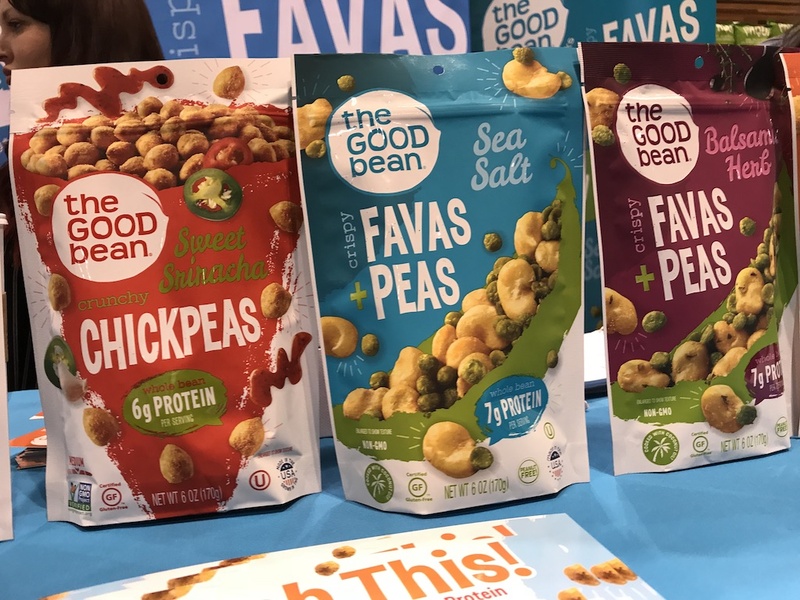 The chickpea was extremely popular this year at the Sweets and Snacks Expo. There were many brands and flavors. The Good Bean had both chickpeas and fava beans and peas. Lots of protein packed into these crunchy and flavorful goodies. 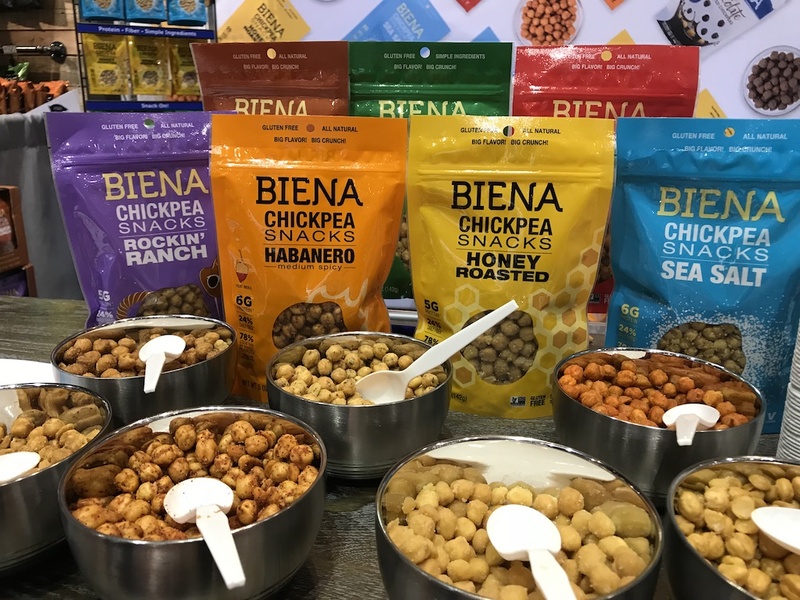 Biena was another vendor with many flavors of chickpea snacks to choose from. High in fiber and protein these roasted chickpeas are a wonderful snack. 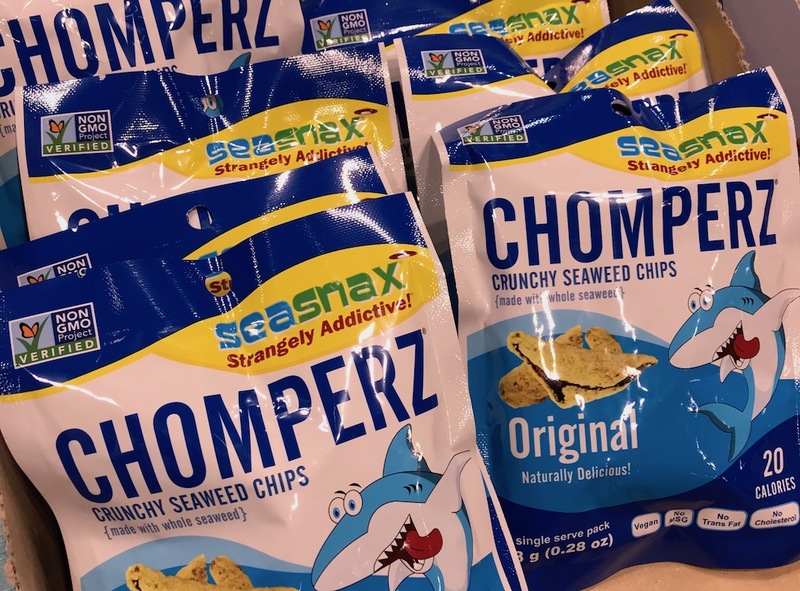 Seasnax Chomperz was another snack that caught me by surprise. I was waiting for Diana and wandering the aisles when a nice lady said hello and asked if I wanted to try these. Now keep in mind, this is after a day of people shoving snacks in your face, in your hand or in your bag. I thought how sweet and civil. I tried them and low and below I liked them! I learned that Seasnax is a family business started by parents who wanted their kids to eat healthier snacks. They use high-quality seaweed from Korea. They also contribute 10% of their annual net profit to non-profit organizations that make the world a better place. Lots of brands make flatbread. 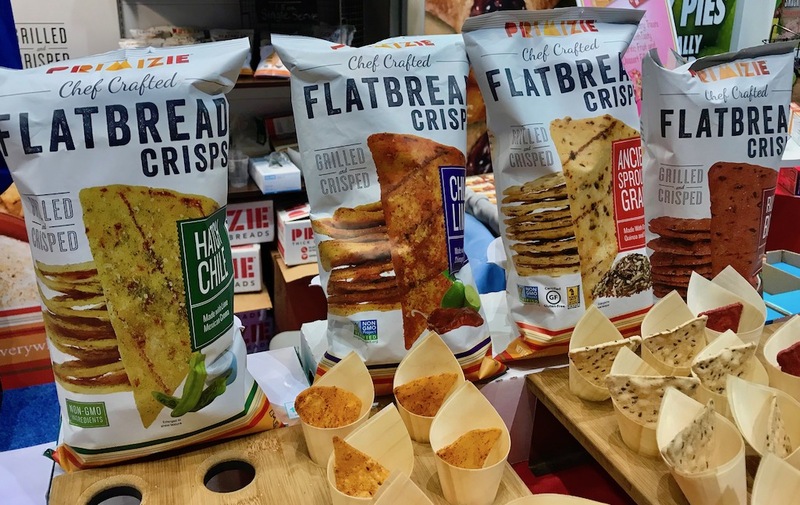 But only one does flatbread that’s grilled and crisped and comes in such unique flavors as Primizie chef crafted flatbread crisps. This husband-wife chef team learned their bread making technique in Italy and the rest is history. Flavors like Italian Everything, Gouda Garlic, Rustic Beet and Chile Lim will make these not only your favorite travel snack but also a pantry stable. I have to include our friends from Good Health and Snikiddy. We’ve been longtime fans and they keep adding new flavors and keep producing great snacks. 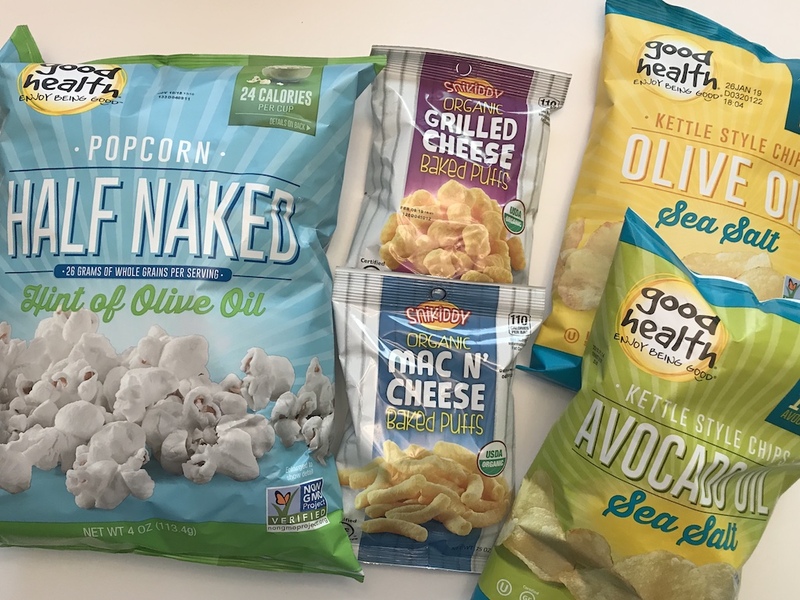 Good Health’s non-GMO Half Naked® Organic Sea Salt popcorn is light on salt but big on flavor. Snikiddy’s gluten-free snacks are organic and taste so much better than those not so good for you snacks. Do you love cheese-flavored puffs? Who doesn’t? 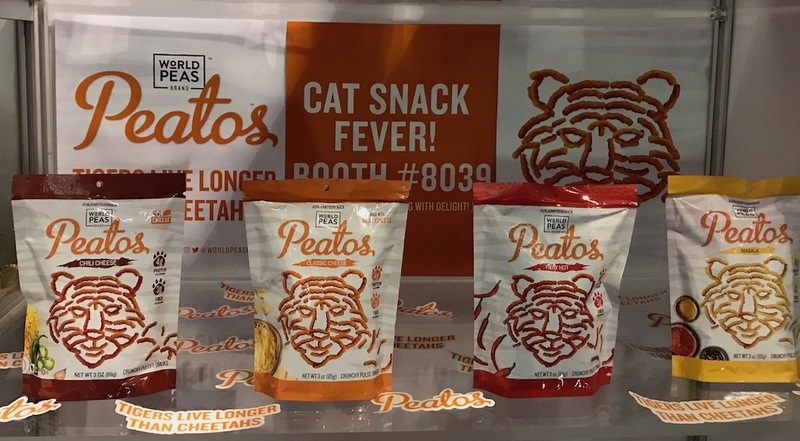 What if I told you that Peatos™ was a crunchy cheese snack made with real cheese and nutritionally dense peas and lentils. Why is that important? With this snack, you get more than twice the protein and three times the fiber of those other finger-staining snacks. Another ringing endorsement. My 18-month old niece LOVED Peatos. Her Mom feeds her plenty of organic veggies and fruits so no surprise that she liked these healthy crunchy snacks. Jerkies are always a big part of the Sweets and Snacks Expo and make handy travel snacks as well. We saw so many brands and types of jerky from beef, turkey, pork, chicken, venison and more in a variety of flavors. 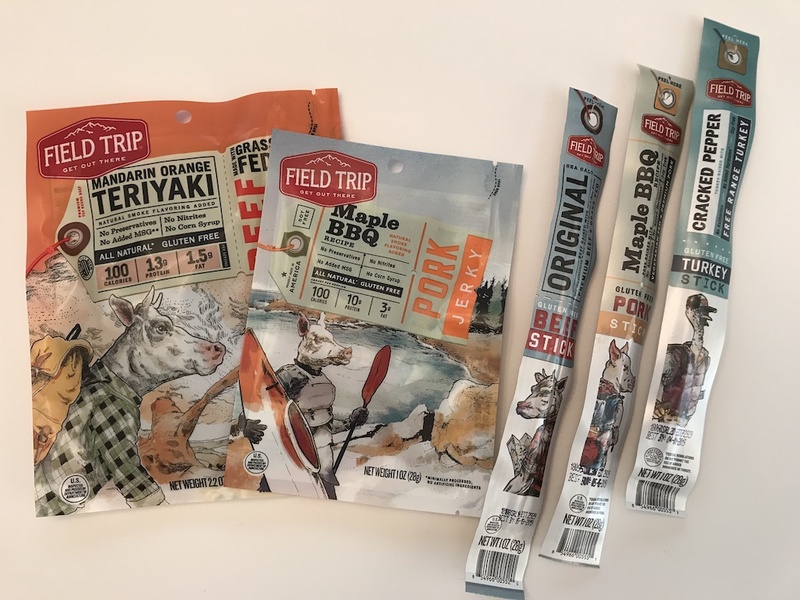 I’m not a jerky fan but Diana loved the jerky from Field Trip. Her favorites were the Mandarin Orange Teriyaki and Maple BBQ Pork. You may have seen cricket and cricket parts on a menu at one of your fine dining excursions recently. Crickstart protein bars were a curious addition to the expo this year. Made with organic whole roasted crickets that are turned into a powder it’s loaded with protein and vitamin B12. They also use other organic products like fruits and seeds. What’s really interesting about crickets is that they are very sustainable. They require 2,000 times less water, 12 times less feed and emit 80 times less methane than cattle making them a very sustainable protein product. 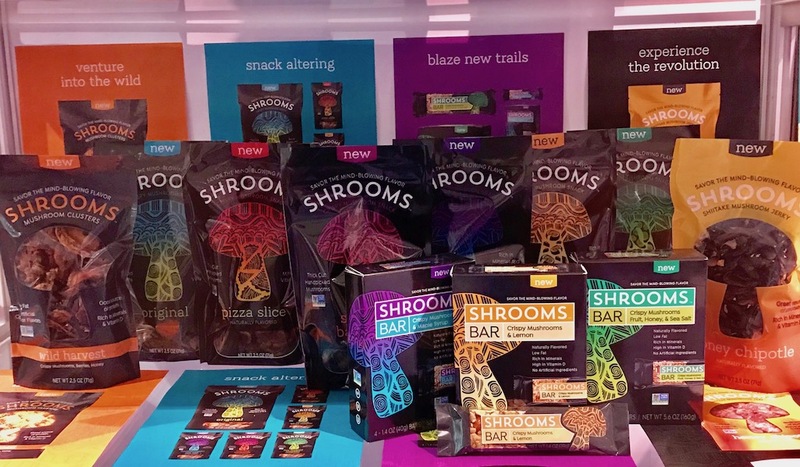 One of the latest innovations we saw at this year at the show was products made from mushrooms. Not in full distribution quite yet these crunchy mushrooms come as dried pieces and slices with flavors or in bars with other ingredients. They are definitely something to be on the lookout for. We sampled several types and they were quite tasty to us mushroom lovers. I have to include one really indulgent salty snack. 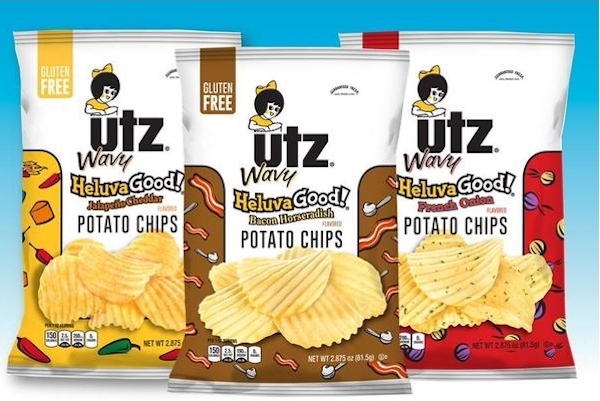 These utz brand Heluva Good! dip flavored chips are so flavorful you don’t need any dip or anything else with them. They come in French Onion, Bacon Horseradish and Jalapeno Cheddar. I could easily eat the whole bag in one sitting. Sweets. I admit that although I always try to pack the healthiest, easiest snacks when I travel I have to have a few indulgences. Whether it’s a square or two of dark chocolate, a candy bar or my downfall Swedish Fish these sweet snacks find their way into my bag. 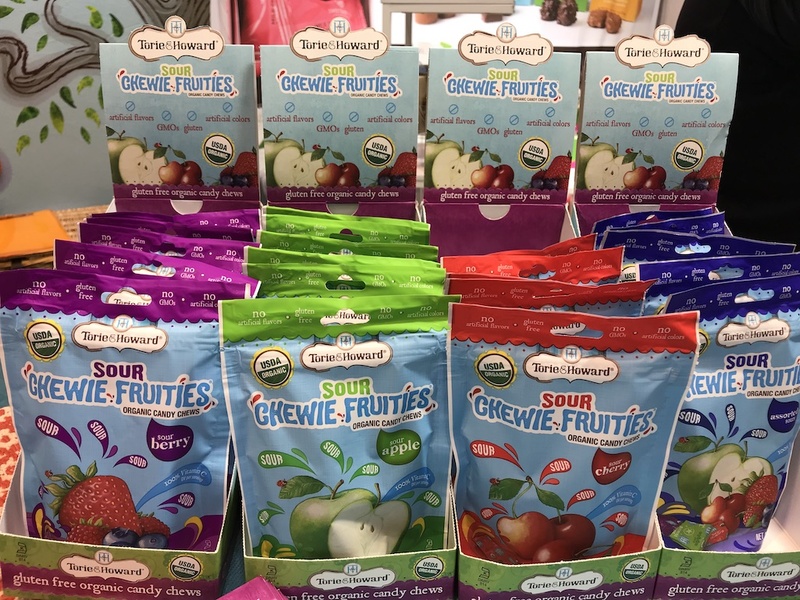 Fortunately, there were plenty of sweets at the expo from old classic brands to new candies purporting to be “healthier.” Here are a few that you need to know about. 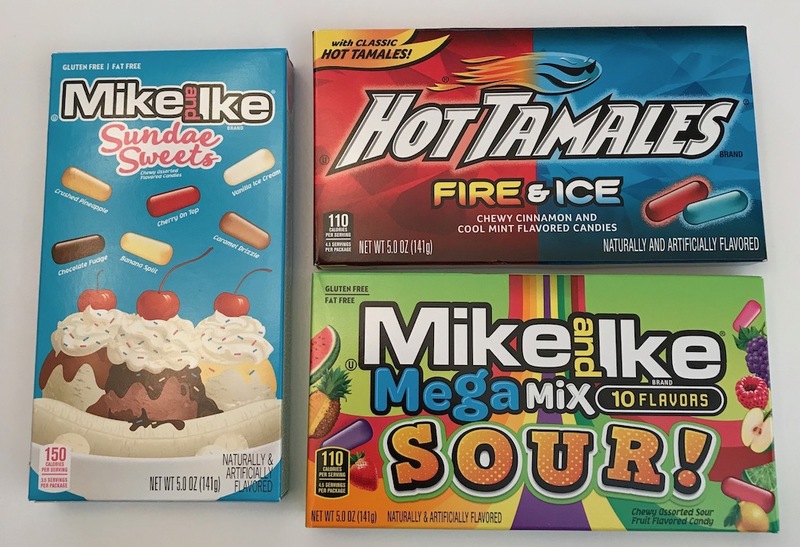 Sours lead the way again this year as a popular trend so it was no surprise to see that Mike and Ikes introduced the sour megamix with 10 flavors. And no surprise that Diana would be ogling all the Mike and Ikes and taking way too many samples of all the latest flavors. She loves these little candies and gets a childlike glimmer in her eyes whenever she eats them. Who can say no to that? We love our friends at Tory and Howard, who we’ve been following even before Oprah named their organic candies to her “Favorite Things” list. Even they jumped on the sour train and added some fun new packaging as well. If you haven’t tasted this brand give them a try. I’m a huge fan of the Meyer Lemon and Raspberry. I like the handy little tin to keep in my bag. It’s cute and always makes a nice presentation when offering a seat mate a little treat. They can’t help but ooo and ahh. 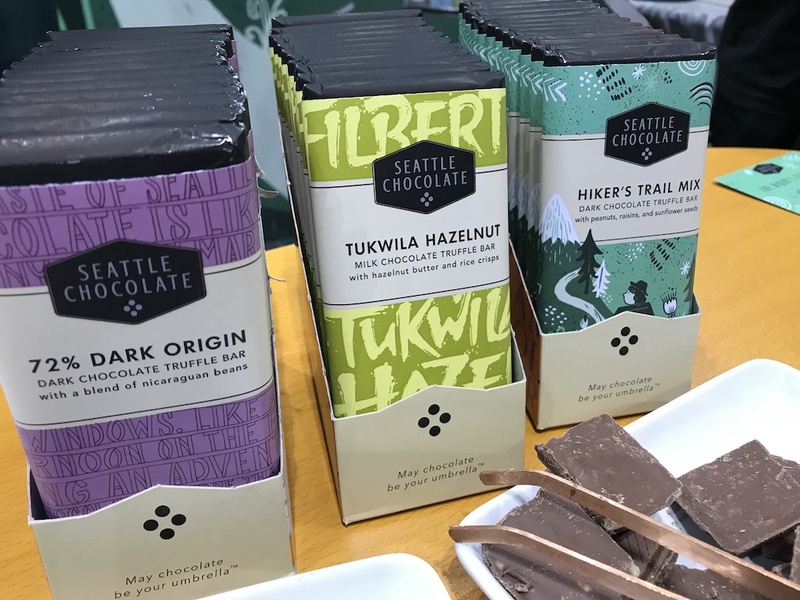 If you’re a chocolate fan, be sure to check out Seattle Chocolate. This women-owned company not only has great tasting chocolate that is certified Kosher, many are GMO project verified, gluten-free and vegan, too. We sampled the truffle bars and they are delicious. We also loved their unique new beautiful packaging. Another fun product they have is chocolate gifts. Bars and boxes that say “happy birthday” (hint – remember it is my birthday month) or thank you. Who doesn’t love an edible gift? What also sets them apart is their philanthropy. With their jcoco line they donate a serving of food to someone in need. If you like dark chocolate, really dark chocolate then Ghirardelli Chocolate has you covered. 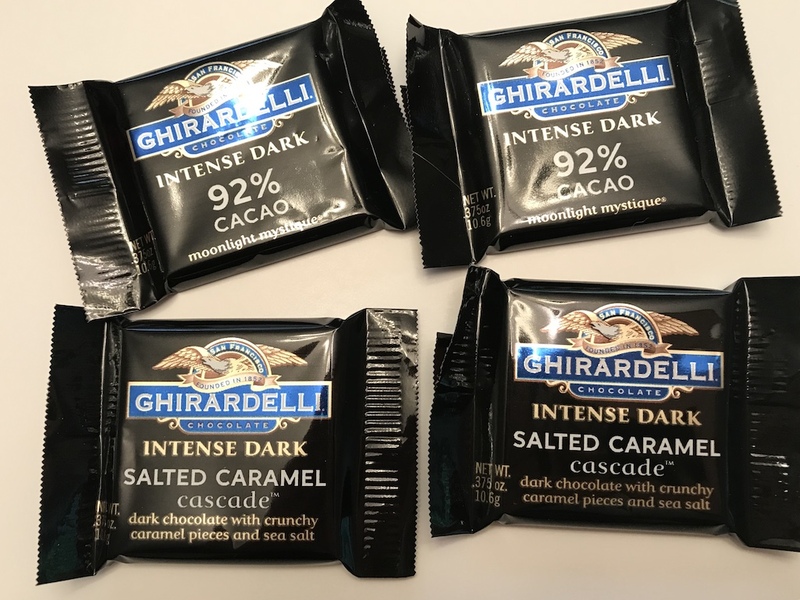 Their new Intense Dark 92% cocoa more than fits the bill. Remember, dark chocolate is a super food so this indulgence is good for you in moderation. 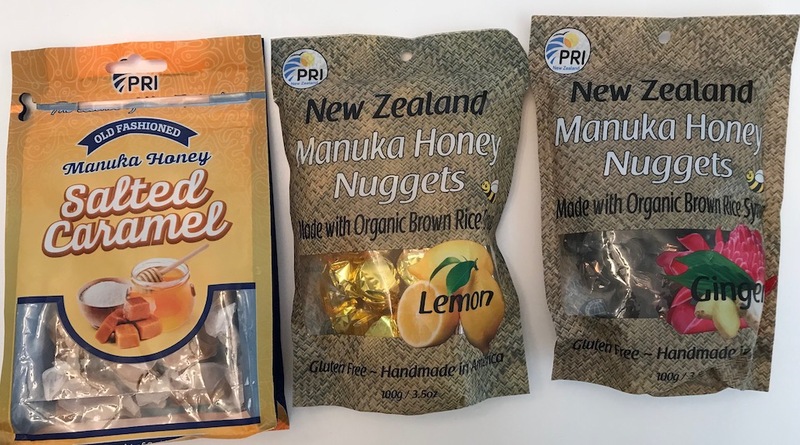 Another candy with some “good for you” qualities is New Zealand Manuka Honey candies. Manuka honey is another superfood that has claims of aiding digestion, antibacterial properties and boosts your immune system. While all honey has medicinal properties, Manuka honey is an even higher grade, which can be more beneficial. It also tastes great. The lemon drops are a great way to soothe your dry throat on a long flight. 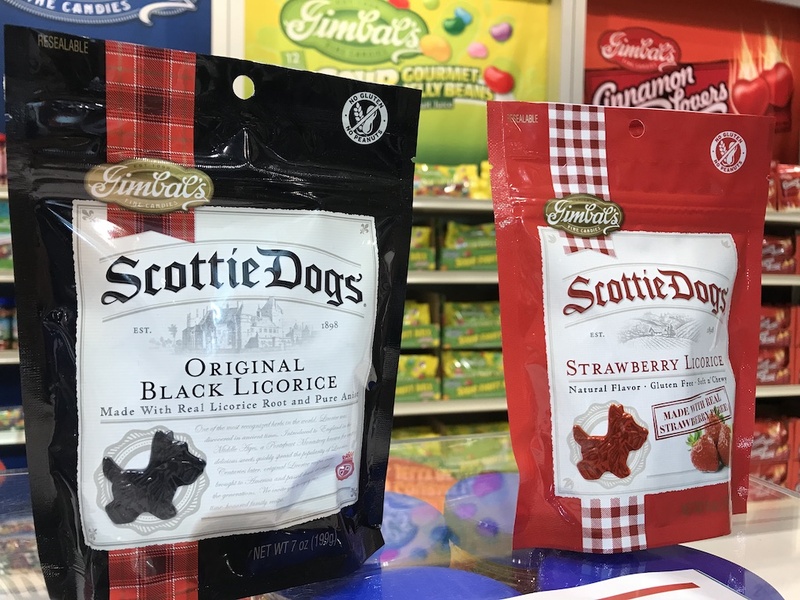 If you’re a fan of licorice you may know about Gimbal’s Scottie Dogs. The original black licorice has been around for years. You’ll want to try their new strawberry Scotties. They are made with real strawberry juice. We loved the soft yet chewy texture and rich strawberry flavor. The handy zip-close bag makes it another terrific travel snack. One caution: you may find it difficult to stop eating these tasty little pups. One of the things that is really cool about the snack world is that new products come out just about every day. It’s always fun to be on the front line tasting and discovering all the new tastes and creations. What about you? 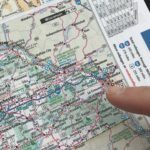 Do you travel with snacks? I have a bar or a bag in my purse even if I’m just running to the store. 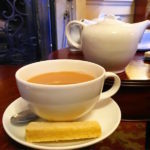 You just never know when you’ll want to treat yourself to a little nibble. I hope that you think about what you’re eating the next time you grab something at your local grocery store or airport and find something good and delicious that’s a treat just right for you. I had no idea this Expo was a thing. I would absolutely love to go to this. It looks like you had a great time! My sister is a manager at the movie’s and they went to an expo like this and she came home with like 3 totes of goodies, they really didn’t pick any of the snacks however they went for the freebies. I’ve always wanted to go to an expo like this. However I went one with the owner of a restaurant i worked at last year, it was really awesome. These are always a blast to go to no matter if you work in food service or not. I want to book mark this expo, looks pretty awesome. I’m holding you to your word when you say “best ever”. I need to start carrying snacks with me so I don’t indulge in drive-through food. I’m grabbing your favorites for a taste test now. I think I need to go to this event!!!! I have tried quite a few of these things before (thanks Costco samples) but there are clearly so many more out there. I want to try the cauliflower crackers. WOW – all those snacks in one place. Sorry I missed this – I would have gone. 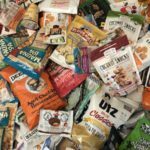 I totally agree that some of those are the best snacks ever…to take anywhere and anytime. Why didn’t I know about this expo? I LOVE food. Chickpeas are one of my favorite snacks. I agree on so many levels about kind bars. I am so happy to hear of the alternative with no nuts! I always have a sweet tooth while traveling. Mike and Ike’s are my favorite!!!!! I haven’t seen the sundae flavors before but I want to try those. Sounds like we like the same kind of snacks Shelley! Looks like you had a great time tasting all those snack foods! I’ve not yet tasted Seattle Chocolate, so thanks for the tip. I will check them out! The cauliflower crackers have me intrigued! I have not been able to find a way that I like cauliflower yet! We already really like those KIND bars. They are my favorite! Sounds like my kind of show, except for the crickets! I enjoy going to the Fancy Food Show in NYC. It’s fun to taste test all the new products. An expo devoted to sweets and snacks? Mind blown. It’s great to see so many healthier options showing up and helpful to get your feedback on the flavors. Cricket, mushroom, and cauliflower-based snacks are certainly new to me. I’m not a fan of sours but I’m all in on dark chocolates. Now I hope the manufacturers can innovate on packaging too because we have all got to reduce plastics. I love snack sizes for travel but always concerned about the amount of waste they generate. This is a great selection of travel snacks.I’d like to try the Peatos but think I’ll pass on the Crickstart. Snacks are one of my favorite parts of traveling and I always look forward to seeing what unique treats the locals are munching on. 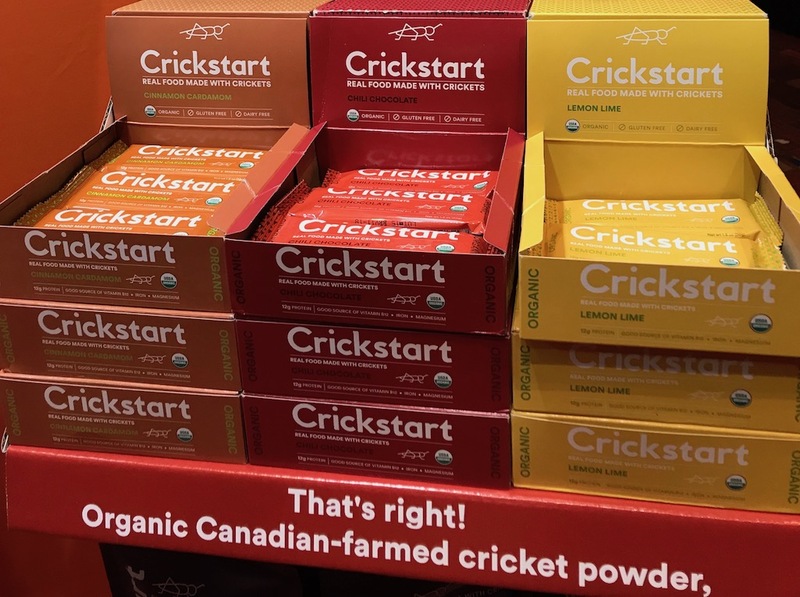 I’d definitely be down for trying the Crickstarts since the crickets are ground up (and how cool they’re so sustainable too), and those Shrooms look interesting. Sounds like my kind of Expo! What a great show to attend. I’d love to have quite a few of those snacks packed in my bag. Especially when I travel to India! I’m a big fan of cricket snacks and the EXO bar, will have to keep a lookout for the Crickstart brand. You’ve highlighted some great healthy alternatives to what is usually available if you don’t pack your own! Oh dear. Cricket snacks. I’m gonna have to pass. I did accidentally eat part of a grasshopper the last time I was in Mexico. At least I think I did. I’ll put it this way. I found half a grass hopper on my plate. I had to take off my glasses to see the spindly legs which is how I knew I definitely needed to update my eyeglass prescription. But, I digress. Travel snacks. I usually promise myself I won’t eat c*ap on airplanes. Then with visions of being stuck on the tarmac for 4 hours (or something), I run off and buy gummy bears, Good and Plenty and Twizzlers. Then, by the time we get wherever I’m going, I’m totally sick. I usually have fruit slices or roasted unsalted .nuts for snacks. But my one fave healthy thing is Cheetos. Now that there is healthy PeaTos, I am redeemed!